After the reverberating (cough) response following the coverage of The sinking of Hawaii, Doofus Maximus appears again – only this time, he has an animal’s point of view. A pig. About how they do not have it easy in this cold cruel world of humans. Now with swine flu, they hate it that their already tarnished image is being given a shot. Doofus Maximus reporting, for comic relief only. “Ah all you swine, let our minds entwine, we need to draw the line, and recreate an image so fine, that humans see us shine, and treat us with respect as they dine!“. Pigs are not happy with several expressions from around the world in different languages – “eat/smell like a pig“, “this place is like a pigsty“, “son of swine” etc. The last one, they say, was spoken out with deep passion in an Indian movie – Sholay (suar ke bachchon), and thereafter, most of this country’s citizens used it as a calling that lacked affection. And now, pigs feel that ‘swine flu’ is going to cause their popularity charts to plummet further. The spokespig added that humans are going to hate pigs more. They are indeed pushing for the renaming of the virus strain to H1N1, so that the general morale of pigs stays higher. This event was originally organized by the GRaceful Union against Negative Treatment (GRUNT), but they were disgruntled that GRUNT did not quite reach human ears. Humans ignored it as a mere grunt. Then the management gurus advised them to change their name to Oppression and Insensitivity are Not Kool (OINK) but that failed to make a point poink as well. “We thought, at least by spelling ‘cool’ as ‘kool’ is going to get some attention!“, Mr. Yudai was heard saying. Let’s hope their oinks and grunts are heard this time and they have better times ahead. 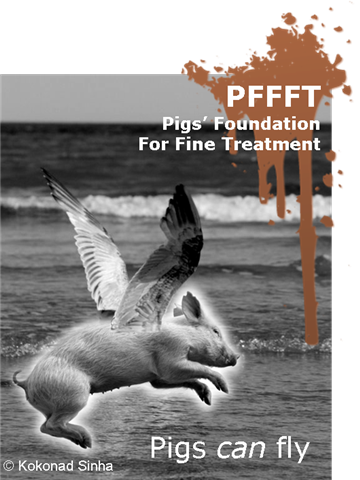 Below is the poster for PFFFT, an organization that has set out to make a difference. Roshmi’s take on the issue – how you can turn swine flu to YOUR advantage! Jai Iyer says (draws, rather) – After all, pigs are people too, you know! Hey! You’ve got a new favicon for your page! What’s mp..by the way?? Matte Phinish?? And Lol! Awesome post. So much for pigs! Who would have known! Whoa! Stunning display pic! It has increased the average beauty of this page threefold! Thanks for liking the post. Btw, MP stands for Mostly Pointless, but Matte Phinish sounds GREAT! Aside, that favicon never shows up on blogrolls 🙁 I have no clue why! Awesome post. Pigs can finally look up to Doofus as their messiah. And the poster complete with a mud splotch must have been some work on Photoshop. I’m unskilled with Photoshop. Thanks for the link – though I think there is some kind of new found evidence that a man might have given swine flu to that pig. Which makes it weird, because then it should be called MAN FLU. Hi R! I am REALLY REALLY happy that you noticed that name! 😀 I love coming up with names like this – the other Dewfus post had Indi Nayal and Pizzacau Zes Obesiti. I guess my all time top favorite creators are those of Asterix and Obelix – the names they came up with! LOL. No, wait – ALOL. Yeah, that mud splatter and the flying pig were both photoshopped onto that bird picture I credited, which I had taken in May 2008. Although, I use GIMP, not Photoshop. The latter is very expensive. Hardly affordable. 🙁 GIMP comes free! err… is that the default icon for commentors.. I swear I don’t have that face! Heh heh heh! Thanks for dropping by Richie! 🙂 Long time no hear/see! And oh before I forget… several newspaper/media offices would have been ransacked by now… for referring to such a ‘sacred’ animal as ‘swine’… !!! India has enough politicians wasting money as it is! Don’t give them ideas! Heh heh, Varaha party! That’s a hilarious insight, Roshmi! Ha ha ha ha! Since masks have become very popular ever since the Gujarat satrap got his supporters to don them (Modi masks)… the Varaha party/Varaha Sena members too will wear masks… then they can look like each other and that will bring ‘uniformity’ to their campaign… as well as distinguish them from the ‘hoi polloi’… no prizes for guessing what mask that will be, though! Roshmi´s last blog post | ‘Chicken-hearted’… ??? Cluck! Cluck!! Hmmm….. I did a bit of it though @ ‘Chicken-hearted’… ??? Cluck! Cluck!! Roshmi´s latest blog post | Between the ‘Eye’PL lines…!!! Tough life… being a ‘chicken’… Sigh!! Ever since their ‘flying’ genes (H5N1 Bird flu) jumped the species barrier to pigs (A/H1N1 Swine flu), these poor souls are under intense pressure and facing stiff challenge at their “annual flying competition”… from their fellow ‘fauna’… the swines, ok pigs… Alright! Alright! Country cousins of ‘Babe’… !!! Hey, hang on… did I hear Oink! Oink! A piece of advice to all the ‘swines’… umm to all the country cousins of ‘Babe’… don’t reveal your identity on ‘Facebook’ or ‘Twitter’… the number of hits may decrease and Facebook may cancel your account while Twitter may suspend it due to ‘suspicious activity’!!! 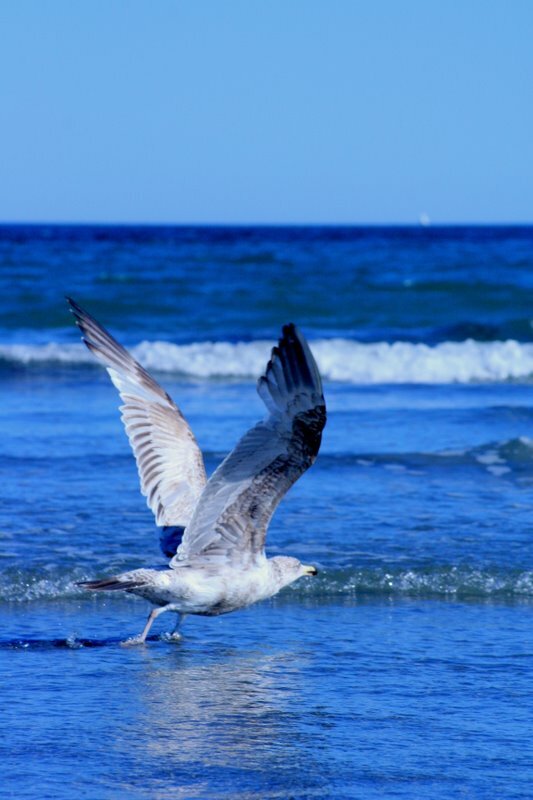 After all ‘Twitter’ is helmed by a little blue ‘bird’… which ‘flu'(ew) once and may not want to do so again!!! …and I commented on it too! It is hilarious! Looking forward to part 2! Roshmi´s latest blog post – Piggy-Wiggy: "To err is human, to forgive divine"… Or is it _ _ ine… ?!! Thank you, SR! And welcome to my blog!